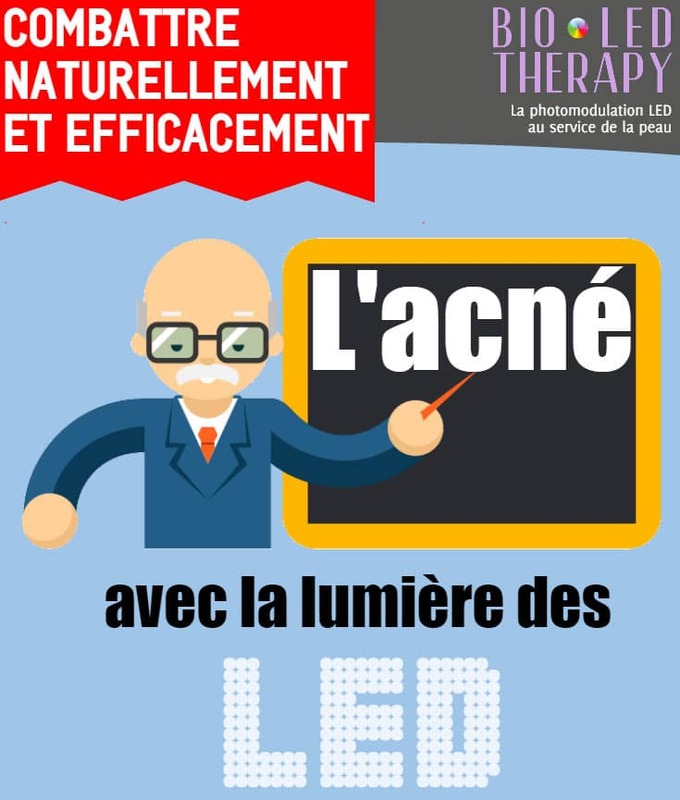 LED phototherapy: a natural and effective treatment to get rid of acne! Teenagers suffering from acne pimples: war is declared! Whether we call them pimples, blackheads or blackheads, acne is hidden under multiple names and devours the faces of teenagers and adults. Where acne spreads, chemicals spread. It is time to stop this invasion of sebum and aggressive remedies. Did you know that LED phototherapy can help you effectively fight these dermatological inflammations without pain and without aggressiveness for your skin? As you can see on our computer graphics at the end of this article, 85% of teenagers and 25% of adults would be affected by more or less severe acne. Why are teenagers more affected by acne? Simply because the hormonal upheaval caused by puberty causes the skin to thicken while dilating its pores, leaving room for impurities such as acne to sneak in. A dermatological plague that is difficult to tolerate and sometimes leads to complexes or loss of confidence, especially in adolescence when the body and head evolve much too quickly. Some studies even show that the “pimply” teenager would be more shy, more erased than others. Of course, teenagers fight mercilessly against their enemy acne. But with great strokes of chemicals or hazardous manipulations, acne gains ground and mocks him for his omnipotence! Faced with this barbaric intruder represented by acne on the face or body of a teenager or adult, multiple dermatological products and scientific experiments have been carried out for many years. The study carried out by Professor Chu during the 2000s would seem to be one of the most promising in terms of acne treatment: LED photomodulation. The British professor wanted to carry out a complete analysis of acne treatments with LEDs using blue and red light. Blue light, already mentioned as a first step in the cure by Professor Tzung in 2004, would act as an overpowering antibacterial on the acneic face. Then according to Dr. Fouque dermatologist”[…] With its wavelength of 405 to 420 nanometers, it will, without causing skin damage, act on the P. Acnes bacteria that colonizes the sebaceous gland”. Blue light combined with red light, which will heal skin inflammation and promote healing, would therefore finally be an effective and natural remedy to treat and overcome acne. At the end of his study, after testing different treatments on 107 patients, Professor Chu found that LED phototherapy treatment was the most effective. Indeed “an improvement on 76% of the cases treated was observed, i.e. a reduction of three quarters of the comedones present” notes the Professor, delighted. Based on the very encouraging results of Dr. Chu’s study and other experiments conducted on LED phototherapy, Bioledtherapy now offers three LED face masks. The LED mask allows you to reproduce the beneficial effects of photomodulation while being comfortably installed at home. Thus, you will be able to use the LED mask at a regular rate in order to effectively fight acne but also to improve the appearance of your skin, rehydrate it and restore its tone and radiance. To effectively fight acne, Bioledtherapy advises you to use the LED mask twice a week for the first month and then once a week. Thanks to this totally natural and painless LED light therapy cure, acne will only be a bad memory and your face will regain the luminosity and softness of its childhood. In addition, the LED mask helps to fight against the effects of age or premature aging of the skin due to a previous acne, precisely, or a lifestyle that would have affected it. So don’t hesitate to take advantage of the visible acne benefits of the Bioledtherapy LED face and neck mask while using a natural and effective treatment against your lifelong enemy. It’s time to declare war on pimples! Previous Previous post: Sunburn, what to do? Treat by photomodulation!